The Freedom and Justice Party (FJP) and the Salafist Nour Party are among a number of political parties to announce they will boycott today's meeting with Field Marshall Mohamed Tantawi, due to the violent clashes near Cairo's defence ministry that have left 11 dead since this morning. The meeting was scheduled to discuss the government-parliament spat, the Abbasiya clashes and the beleaguered constitutional assembly. Joining the boycott, in addition to the two main Islamist parties, are the liberal Wafd Party, the Adl Party, and the Socialist Popular Alliance Party (SPAP). The decision to boycott the meeting came after violent clashes near the defence ministry in Abbasiya killed 11 people Wednesday. Unknown assailants attacked protesters who had been staging a sit-in for four days to voice their anger at the disqualification of Salafist Hazem Salah Abu-Ismail from the presidential race. The spat between the government and parliament has entered its fourth day after parliamentary speaker Mohamed Saad El-Katatni's decision on Sunday to suspend parliamentary activity – effectively go on strike – until 6 May in protest at the El-Ganzouri government's refusal to step down. The Muslim Brotherhood's FJP called for the El-Ganzouri government to step down after parliament rejected the government's economic and political programme on 24 April. However, a number of political parties and MPs rejected the FJP's stance, insisting the government should continue until the end of the transitional period. They said El-Katatni's decision reflected the struggle between the SCAF and the Brotherhood. They also rejected El-Katatni's decision to freeze parliament. This is the third meeting between the SCAF and political forces to attempt to resolve the constituent assembly membership crisis. The second meeting was on 29 April, during which the SCAF announced six criteria for forming the constitution-drafting assembly. Mahmoud El-Khodeiry, head parliament's legislative and constitutional affairs committee, described the agreement as an infringement upon the authority of parliament to freely choose members of the constitution-drafting assembly as dictated by Article 60 of the March 2011 constitutional declaration. 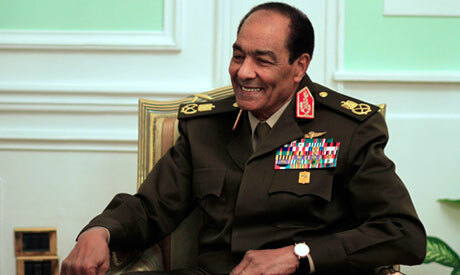 The committee rejected the SCAF's criteria. Earlier in April, El-Katatni commissioned the parliamentary committee to define the criteria for selecting members of the constituent assembly. Attempts by Egypt's political elites to proceed in the constitutional-drafting process have been beset with troubles from the start, the first assembly being disbanded. Days after the formation of the first assembly, a mass walkout jeopardised the constitution-drafting body. Members from liberal and leftist parties, independent prominent figures and representatives of professional and trade unions as well as representatives of the Coptic Church and Egypt's main Islamic authority, Al-Azhar, all pulled out, citing disproportionate representation.